In 1863, two missionaries from Hawaii were sent to Samoa to establish the Church there. The two, Kimo Pelia and Samuela Manoa, labored faithfully for nearly twenty years, isolated from the strength and support of the Church back in the United States. Pelia and Samuela baptized a few people on Tutuila, which is now American Samoa. Later, after Elder Joseph H. Dean and his wife, Florence Ridges Dean arrived, the mission was formally organized on 17 June 1888. By 1891 the mission in Samoa, with headquarters near Apia, was developing steadily. From 1896, members began to join in greater numbers. Missionaries helped educate youths in small chapel schools. As local members filled leadership positions, they were assigned to distant branches (small congregations), a pattern unique to Samoa. Local members were soon serving missions themselves and were greatly contributing to the growth of the Church. Before the turn of the century, 11 branches had been organized on the island. By June 1903, the Book of Mormon: Another Testament of Jesus Christ had been translated. At the end of 1920, membership numbered 3,500, about 5 percent of the total population. 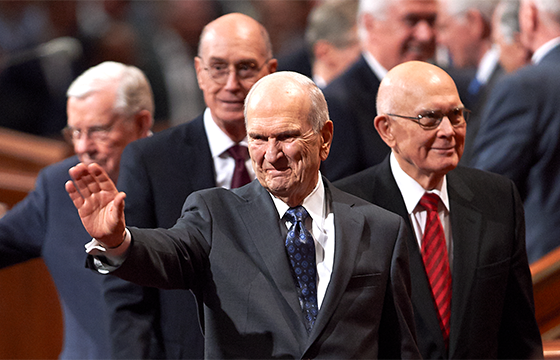 Missionaries were recalled in 1940 prior to World War II because of troubled conditions, and this became a good opportunity for the local members to assume more leadership. After the war, the work quickened considerably. By 1950, membership had grown to more than 7,000 and by 1961, to more than 16,000. By 1974, the country had six stakes (dioceses) and became the first country of the world to be entirely covered by stakes. On 15 October 1977, it was announced that a temple would be built in Apia, Western Samoa. It was dedicated 5 August 1983. At that time, membership reached an estimated 40,000. Six new stakes were created in Samoa from 1994-96. Today, membership stands at more than 55,000 and more than one in four Samoans enjoy membership in The Church of Jesus Christ of Latter-day Saints. The temple in Apia burned down in July 2003. The First Presidency announced a few days later that the temple would be rebuilt using current temple designs.